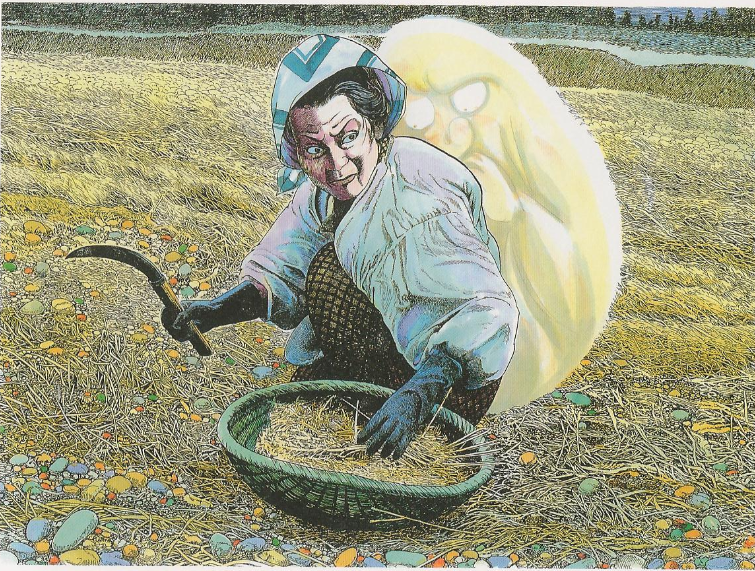 I recently got a request from a reader to help her identify what she called an “old Japanese button.” She had suspected that the image was an onryo, a Japanese vengeance ghost. The image on the button—not really a button but I will call it that for the time being—was easy to identify. 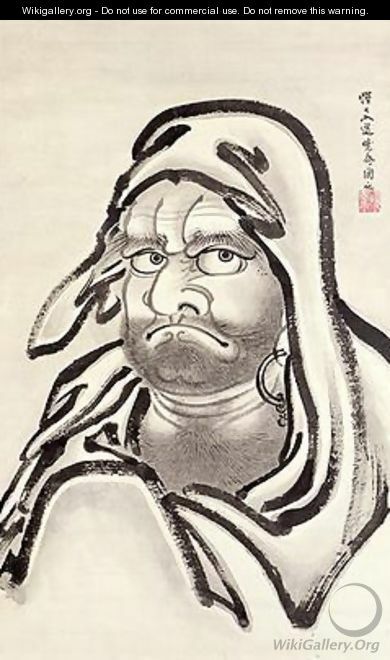 That is not an onryo, but the Buddhist monk Bodhidharma, known more popularly as Daruma. Daruma is one of the most popular figures in Japanese folklore art and in contemporary Japan. From whisky bottles to women’s underwear, you can find Daruma’s scowling face on almost every product-type in Japan. Daruma is a super-figure in Japanese folklore, credited with inventing everything from tea to Shaolin martial arts. He is most commonly found as the wish-granting, roly-poly Daruma dolls. Sold eyeless, you paint in one eye while making a wish, then paint in the other eye in thanks when the wish comes true. 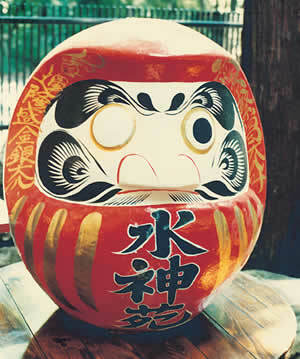 The historic Daruma comes from 5th or 6th century AD. Most of his life is so completely wrapped in legend it would be impossible to sort fact from fancy, but he is often considered to have come from South India, or “from Persia.” Whatever his origin, he is the divine transmitter of Ch’an Buddhism, known in Japanese—and English—as Zen Buddhism. In art, he is depicted as being grumpy, ill-tempered, scowling, with a beard and deep-set eyes. The image on this button, with the emaciated, skeletal form, is very different from the portly and robust figure found in most depictions of Daruma. The scene is most likely taken from Daruma’s “nine years of wall gazing.”In this legend, Daruma was denied entrance into a Shaolin Monostary, so he went to a nearby cave and stared at a wall for nine years. There are several variations on the legend, including one where he fell asleep after seven years and—disgusted with himself—tore off his own eyelids so they couldn’t betray him. Casting his eyelids on the ground, they sprouted up into the first tea bushes which Daruma brewed and drank to keep himself awake for the final two years. The rest of the request—who made this button and what is it?—went out of my area of expertise. Even reading the kanji on the button was difficult, as it is in archaic form and written in a calligraphic style. Neither I nor my wife, who is Japanese, could read the signature. So I called on my friend Aaron Rio, with his big brains and phd in Japanese Art to help in the identification. And help he did! First off, what is the object exactly? All we know for sure is that it is not a button. Without seeing the reverse side and depth it is difficult to make a determination—Is it a medallion or a container? A lid? And why are there cords attached? The best guess is that it is a netsuke 根付, possibly of the kagamibuta 鑑蓋 variety missing it’s ivory surround. Or it is possibly the lid of a small netsuke container. As to the writing, the three characters at left are 民乗, the artist/carver’s name, and then his cipher (花押, kaō), i.e., a handwritten (carved) signature. 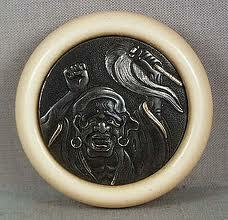 民乗,whose actual name was 海野珉乗 (Unno Minjō, 1873-1910; note the different character used for ‘min’) is a known netsuke carver. He was a professor at 東京芸大 when he died, as was his far more famous father Unno Shomin (海野勝珉), who was also a metalworker. The Museum of Fine Art (MFA) in Boston has at least one netsuke, a kagamibuta, by this artist, and they date it to the late 19th century. Just because it is signed doesn’t mean it is real, of course. There are lots of netsuke fakes. However, Minjō wasn’t exactly a celebrity carver, and he did die rather young, so I’m not sure why anyone would fake his signature. And the signature resembles (though isn’t identical) to the signature on the MFA piece, The MFA has an extensive online catalogue, and you may very well find this other Minjō netsuke there as well. In Saisetan, located on Fukue island in the Goto archipelago of Nagasaki prefecture, there are legends of things that have the power to enter and possess humans. 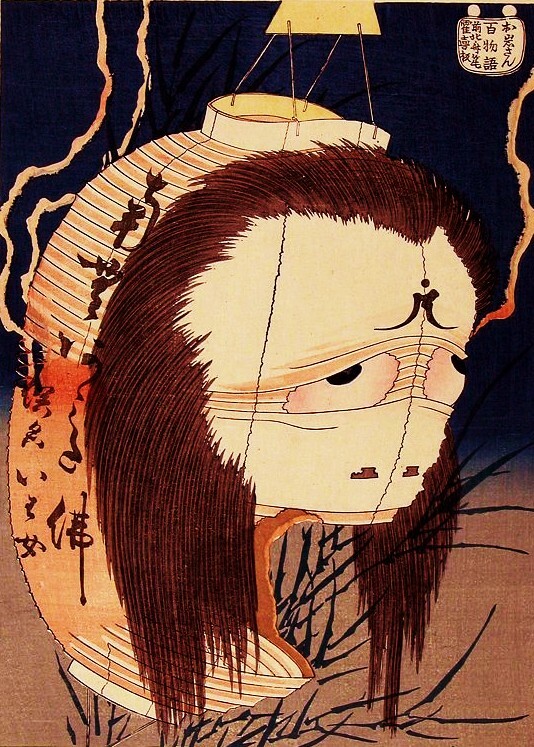 These things (ikiryo, shiryo, dobutsu-rei, kappa, and the curses of various deities of Shinto and Buddhism) are called inen. They cause various illnesses, changes in personality, and spiritual distress. There is also a type of shaman who can speak directly to the inen, interpreting their demands and negotiating the price that must be paid. These shamans are known as Honin. It was long the tradition of the village that the once-prosperous farmer’s wife’s house was built on top of an ancient graveyard. The spirits interred there wanted the humans to honor them and hold regular memorial services, and they made their desires known by causing illnesses such as skin diseases, tumors, and even insanity. You can read more details about inen in the book “Spiritual and Magical Powers” by Sasaki Miki. The word inen is written in katakana, and thus has no meaning other than being a name.